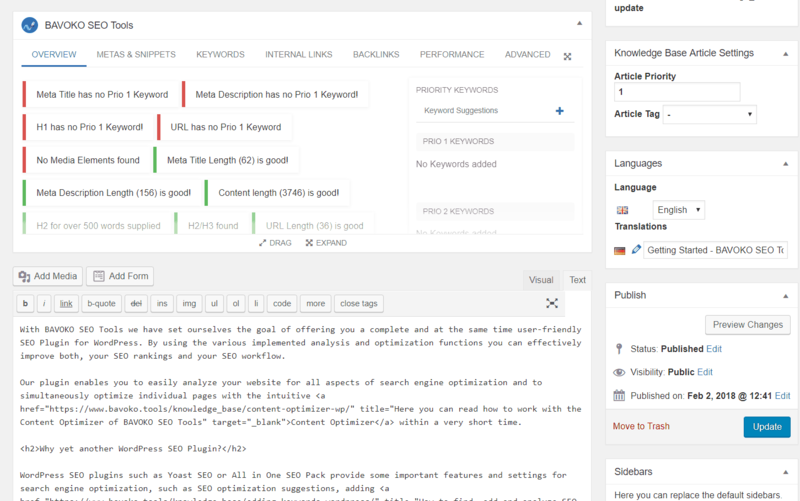 To simplify the search engine optimization of your WordPress site as much as possible, we have developed the intuitive Content Optimizer, which is already available in BAVOKO SEO Tools Free. making all the necessary tools for every important SEO aspect available within single pages in the backend as easy as possible. For this purpose, it consists of many individual tools and features that we have cleverly combined into a complete SEO content optimization toolbox. To ensure a seamless workflow during your content optimization, the Content Optimizer by BAVOKO SEO Tools is integrated in several particularly useful places of our plugin, such as posts and post lists to ensure a seamless workflow. 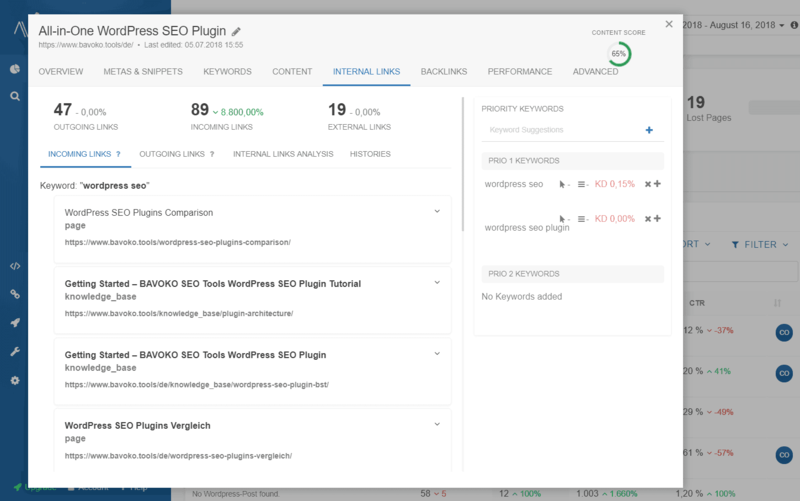 In addition to being able to operate the different SEO tools in the upper part of each post in WordPress, the Content Optimizer can also be opened in a convenient pop-up window by clicking the CO icon within the various analysis views. When opening any post in your WordPress backend, the Content Optimizer automatically loads with it. The Content Optimizer’s Short View is the default view that loads in the top part of the editor, as soon as you open a post. At first glance, you can see the most important SEO optimization suggestions for your page here. To ensure that you always have all important information and SEO tools at hand when optimizing your content, the Content Optimizer sticks to the top of your editor while scrolling through the Short View. With the “drag” function you can adjust the height of the Content Optimizer for a better overview. The “Expand” function opens the Long View of the Content Optimizer, in which you can clearly display all important information about the entire height. Click “Collapse” to return to the Short View. To completely close the Content Optimizer, you can simply click the arrow in the upper right corner of the bar. Any changes you make to the page in the editor are updated to the automatic SEO optimization suggestions within the Content Optimizer in real-time. In this way, you can process those suggestions systematically and in the shortest possible time. Within both, the analysis area of BAVOKO SEO Tools, as well as in your post lists, you can open the Content Optimizer to edit your pages in a popup by clicking the CO icon. In addition to all available functions, such as SEO optimization suggestions, metas, social snippets, rankings and keyword research, you can also edit your texts under “Content” without having to open the respective page. 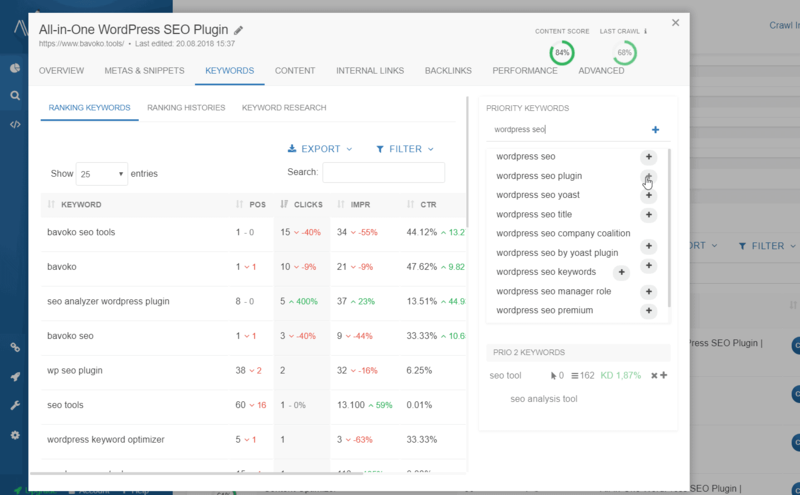 Through this plugin architecture, we combine SEO analysis and optimization, which offers you an unique SEO workflow and save you a lot of time and nerves in your daily work. For the content optimization of single pages, it is particularly important to define the correct keywords at the very beginning, in order to be able to align the content correctly. Therefore you can access the Google Suggest Tool in our Content Optimizer, to quickly find your relevant terms. 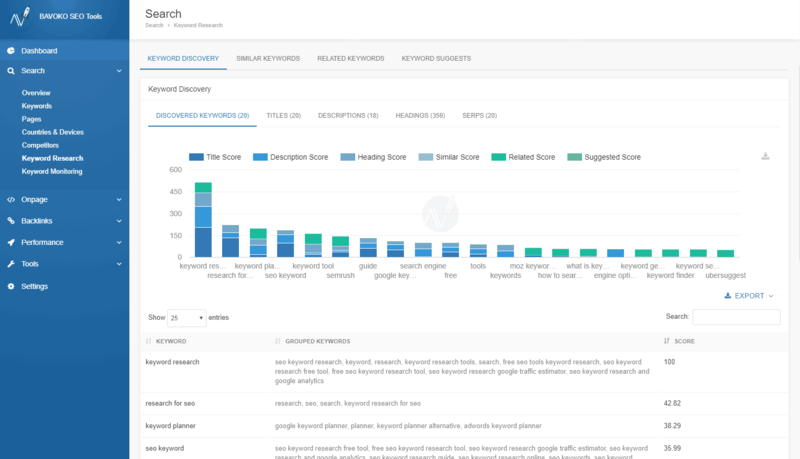 As you add keywords to Content Optimizer, you’ll get keyword suggestions from Google Suggest to find relevant terms and add them with one click. In the Content Optimizer, click on the keyword field within the right sidebar to enter a search term. Enter a relevant keyword and add the entered search term by clicking on “Add”. You can also click on the + sign in the drop-down, which automatically opens with relevant suggestions after you have entered it in the field, to add the respective keyword. 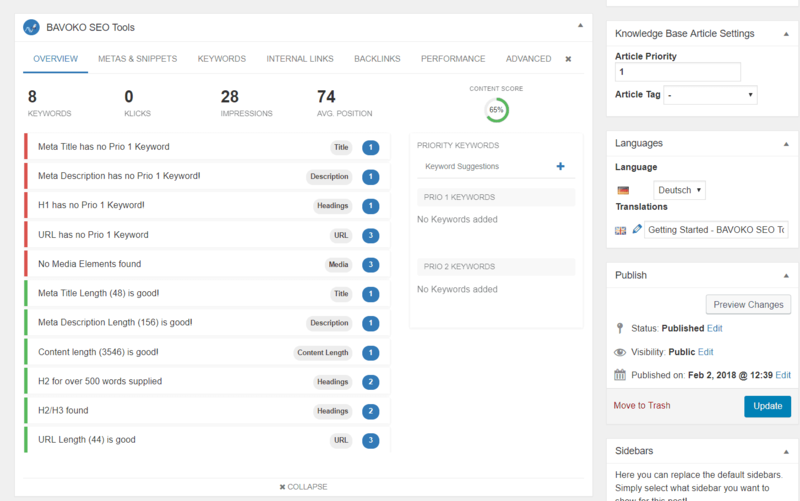 At the same time, the Content Optimizer will help you with the page’s ranking keywords, as well as it’s keyword research to help you find the right keywords. More details can be found later in this article. If you want to know how to best work with keywords in WordPress, read on here. In the Content Optimizers of BAVOKO SEO Tools, you will always receive automatic optimization suggestions within the “Overview”, with which you can improve your website even more easily. In the Content Optimizers of BAVOKO SEO Tools, you will always receive automatic SEO optimization suggestions within the “Overview”, with which you can optimize the content of your website even more easily. These suggestions are determined on the basis of your seo keywords and onpage data and are clearly displayed in the Content Optimizer. For example, you can see at a glance which shortcomings your meta titles, H1 headings, media or content still have and can optimize them in the shortest time. With the Content Optimizer of BAVOKO SEO Tools you can easily change and optimize the SEO metas of your pages. This is available to you at any time in the backend within the posts, as well as via the CO icon. The Content Optimizer opens in a handy popup and offers you the possibility to edit your titles and descriptions for content optimization with just a few clicks. Hint: Meanwhile, look at your previously set priority keywords in the sidebar on the right and make sure you use your SEO keywords in your SEO metas! Within the Content Optimizer in WordPress, click on “Metas & Snippets” and enter the meta titles and descriptions for the page in the corresponding fields. To get an accurate picture of what the meta snippet will look like in Google, you’ll find a handy, Google-style preview above the meta input boxes. As you type, you’ll get feedback by the colored bar, how the number of characters is in good range. Under “Robots”, tick “noFollow” if the search engines should not follow the links on this page. Check “noIndex” under “Robots” if the page is not to be listed in the search results. With the Content Optimizer, BAVOKO SEO Tools offers you a particularly user-friendly interface for the individual optimization of your social snippets for Facebook and Twitter. Open the Content Optimizer for the respective post and go to the tab “Metas & Snippets”. Then click on the respective views for Facebook and Twitter, add your desired text and save it. Just like when editing your SEO metas, you will find the respective preview for Facebook and Twitter directly above the input fields. In the Onpage Analysis under “Social Snippets” you can also find out which pages do not yet have optimized previews and can directly optimize them in the Content Optimizer with a click. Under the menu item “Settings” you will find the setting “Activate automatic Snippets”, with which you can accept your SEO metas directly as social snippets. In addition to access via the search area of BAVOKO SEO Tools, the Content Optimizer provides you with another option for analyzing your page rankings. Click on “Keywords” in the Content Optimizer to view all rankings of the respective page in a sortable and filterable list. This view also allows you to edit your SEO keywords directly at any time with just a few mouse clicks. Read more about ranking analysis here . 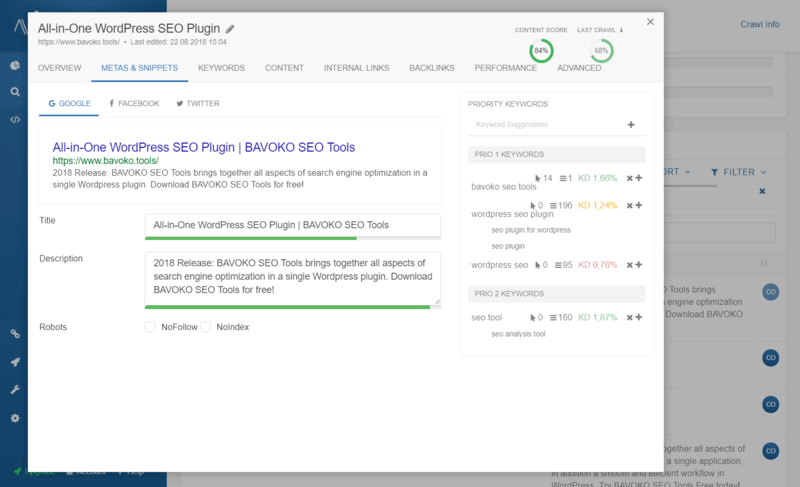 BAVOKO SEO Tools provides you with various keyword research tools not only within the plugin’s search section, but also in the Content Optimizer and thereby gives you the possibility to search for the right SEO keywords during content creation or optimization and to add them directly. In the tab “Keyword Search” you have the possibility to search for the same (contains keyword) and similar keywords, as well as to start a WDF * IDF analysis for a given search term. 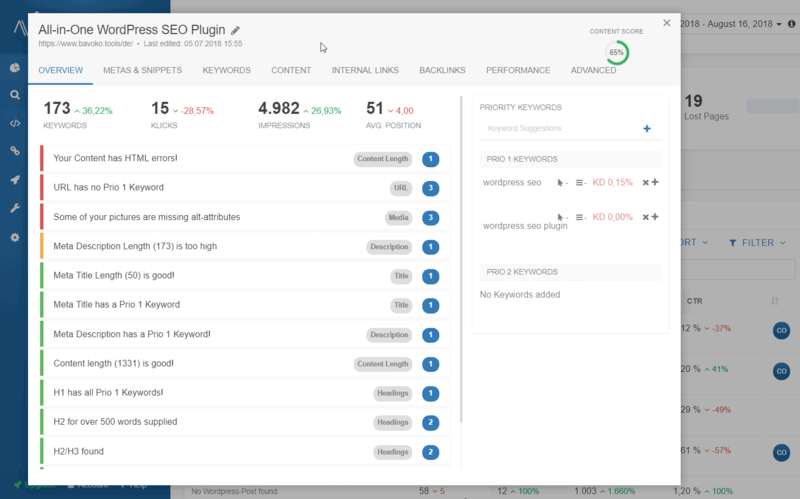 To further enhance your content optimization, we also offer the Keyword Discovery Tool here, which runs all three tools simultaneously and outputs their data in such a way that you can see at a glance which are the most relevant keywords for you. 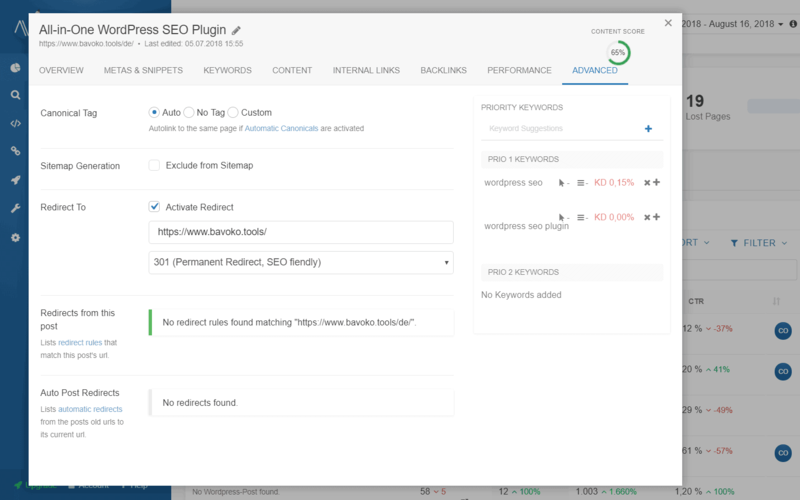 In addition to the Internal Links Manager in the “Tools” section of the BAVOKO SEO Tools Plugin, you can also set internal links within the pages, using the Content Optimizer and the integrated 1-click solution without any effort. 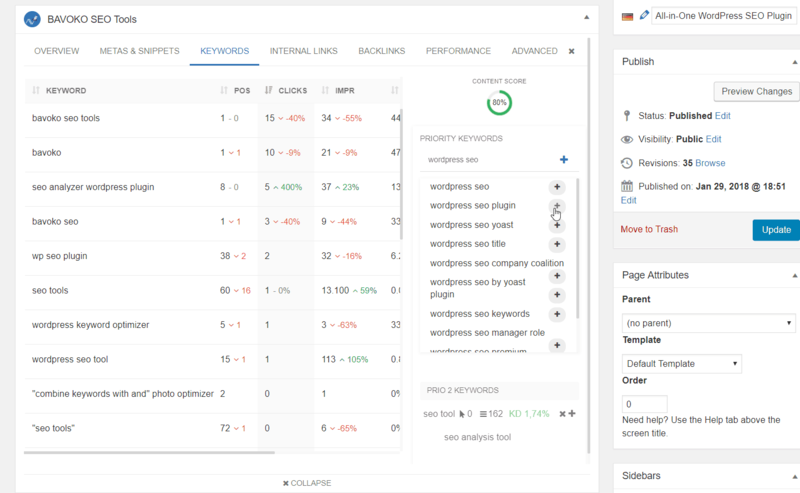 Based on the SEO keywords you have defined for your pages in the Content Optimizer, our system suggests internal links in the right places, which you can than set with a single click. Under the “Internal Links” tab in the Content Optimizer you will find a view for the incoming links to the respective pages and one for the outgoing links. Take a closer look at the suggestions and decide which links should be set to or from the respective page. To do this, click on “Set” to set the link or on “delete” so that the suggestion is no longer displayed. 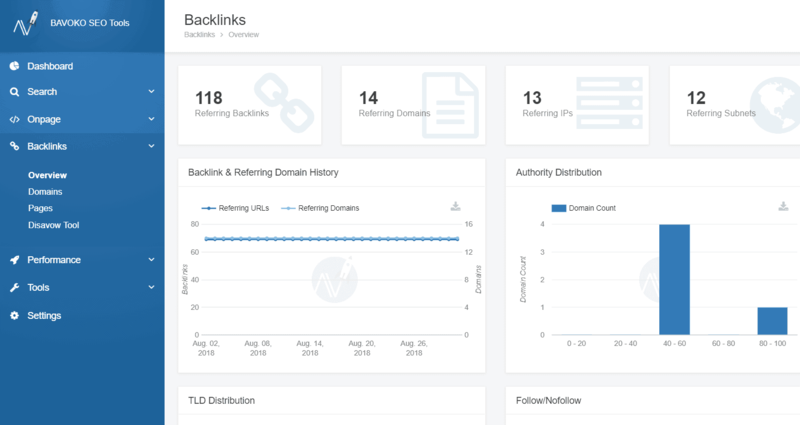 Under the “Backlinks” tab in the Content Optimizer you can view all external links referring to the respective page within a sortable and filterable table. It is important that the data connection for the backlinks is set up correctly. In the “Advanced” tab, you can change the settings for your Canonicals, Redirects, Sitemap and Meta Robots in a practical overview. In order to avoid search engines misunderstanding similar contents of your pages as “duplicate content”, it is necessary to define Canonical URL’s in some cases. For pages with duplicate content, define a common canonical source page whose content is to be indexed on behalf of that of the other pages to avoid penalties. Canonicals are particularly common in online shops with many similar products or multi-page categories and tags. Under “Canonical Tags”, the default setting “Self” is set for each page. Thus, each page is its own original page. Simply replace “Self” with “Link or Post ID” in the drop-down menu if you want to specify another source page and enter the corresponding URL or Post ID to the field below in the next step. Select “No Canonical” if you do not need a Canonical tag for this page. Within the Content Optimizer you can easily redirect the respective page via 301 or 302 to avoid error pages. In “Redirect To”, enter the URL of the page you want to redirect to in case of an error in the text field provided. In the drop-down, select the type of redirect, i.e. 301 for a permanent redirect or 302 for a temporary redirect. Activate redirection by checking the “Activate Redirect” box. To check your configured redirects, you can view your already configured redirects under “Redirects from this post”. For more information about redirects and about the Redirect Manager of BAVOKO SEO Tools, you can read more here. With the Content Optimizer, we also give you the option of excluding the page you are currently editing from the sitemap with one click. To do this, tick “Exclude from Sitemap” under “Sitemap Generation”. All important information about the practical sitemap functions in BAVOKO SEO Tools can be found here. With the Content Optimizer in BAVOKO SEO Tools we offer you not only automatic SEO optimization suggestions throughout the integrated content analysis, but also further tools for meta tags, page rankings, social snippets, keyword research and more. 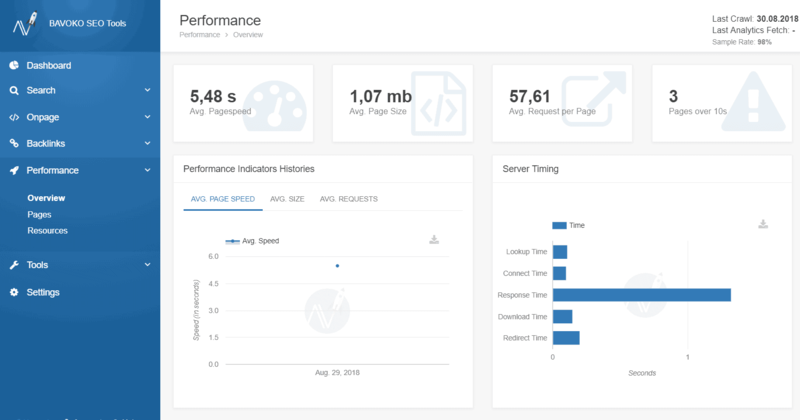 In addition to the wide range of functions, the easy accessibility of the Content Optimizer within the analysis views allows you to effectively save time during your content optimization.